The Latin word jocus means "a joke, a jest, something done for fun," and it gave us the words joke, joc__d ("happy and cheerful"), and today's jocose, which describes people and things that playfully joke around. Jocose people and things are playful and joking in a lighthearted way. 1. Right before a noun, as in "a jocose thing" or "a jocose person." "Jocose" is more sophisticated than synonyms like "joking," "humorous," and "waggish." Talk about jocose dramas and parodies, jocose comments and observations, jocose speech and writing, jocose conversations, jocose faces and expressions and voices, a jocose style, a jocose tone, etc. If you're a jocose person, you might have a jocose spirit or a jocose personality, meaning you're that way all the time, or you might be jocose only in certain situations or with certain people: "She's reserved at school but jocose with the children she babysits." Finally, you might talk about a jocose quality or attitude--like jocose gallantry, jocose solemnity, jocose indignation and so on--meaning it's just pretend or in jest. His lectures are brimming with jocosity, vivid examples, and unforgettable demonstrations, which explains his high rating on RateMyProfessors.com. Because he'd been coerced into saying the blessing over Thanksgiving dinner, and because he hoped to never be asked again, he settled into a jocose solemnity and blessed each individual dish, praising its taste and texture, specifying its sauces and ingredients, appreciating its appearance and abundance. Look away from the screen to explain the definition in your own words. You’ll know you understand what "jocose" means when you can explain it without saying "facetious" or "playful." Fill in the blanks: "(A certain place) (is/was) (alive or buzzing) with jocose (chatter or teasing)." Example: "The camp cafeteria was alive with jocose chatter." 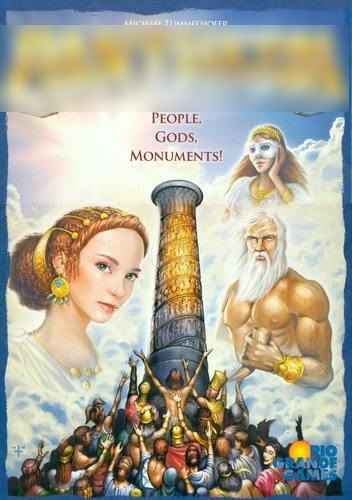 Designed by Bernd Brunnhofer, this game has players attempting to please an unpredictable set of gods with prayer, temples, and monuments. The title's most general meaning is "a set of important people or things that are worshiped or treated with respect." It's pictured below, with the title blurred out. What game is this? Answer: Pantheon. Check out the game here and the word here. 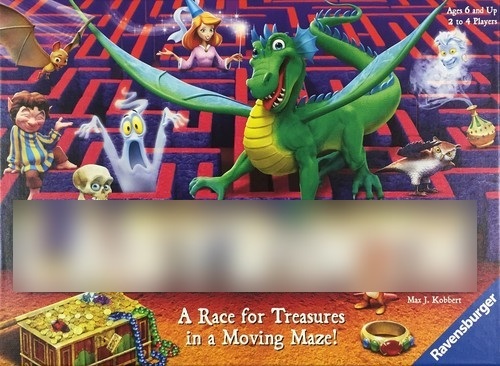 Designed by Max J. Kobbert, this game sends players on a treasure hunt in a maze-like structure with shifting rows of tiles. The title means "something complicated, confusing, and tough to navigate that reminds you of a complex set of paths or passages." It's pictured below, with the title blurred out. What game is this? 2. His material is jocoserious, _____.